14 (Delightful) Christmas Desserts | Simple. Tasty. Good. 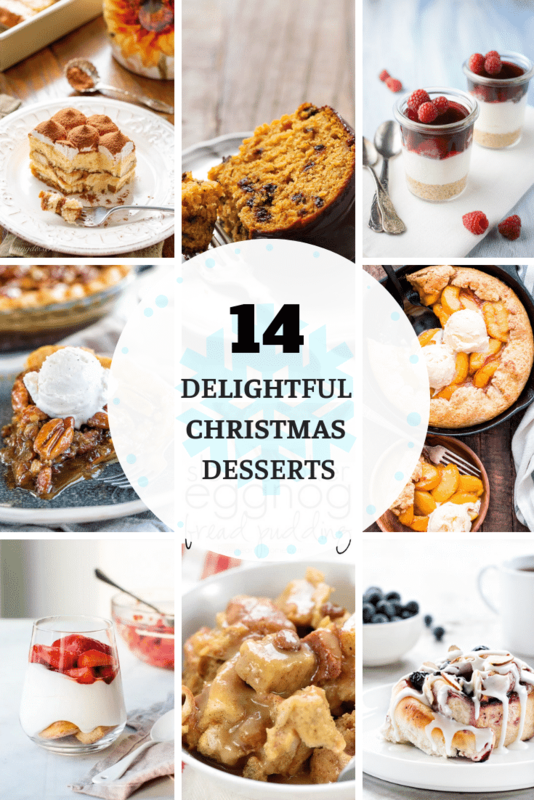 Let me show you my 14 (delightful Christmas desserts! Are you already searching for delicious and inspiring Christmas desserts recipes? Low and behold, rejoice! From this very day on you can now say goodbye to your annual struggle in search for the most interesting sweet dessert ideas to impress your Christmas crowd this year. Well allow me tell you this in the first place: wow! How very brave you are to cook for a bunch of people yourself instead of going out for dinner or something (but hey, there’s nothing wrong with that). Secondly, it really shouldn’t be that much of a stressful business. The magic words are (as always): keep it simple. Less is more! One thing I can tell you: use your prep time wisely. Reduce that heavy burden by preparing as much as you can a few days in advance. Maybe you can count on somebody to help you out a little? Surely you want to spend some time with your guests as well instead of hibernating in your kitchen during Christmas dinner. For the savoury part, dips, quiches, stews or pies are a true blessing here. And what about Christmas desserts then? Same applies for desserts. I have to confess, I am not a natural dessert baker and chef. So all I want is a dessert that I can prep ahead. Preferably something I just have to pop in a hot oven on Christmas Eve, reheat on the stove for just a couple of minutes or take out of the fridge and put it on the dinner table. This year I’m invited to party at a neighbour’s home on Christmas Eve and everyone brings a dish. See why these type of desserts might come in handy? I don’t want to be standing in my friend’s kitchen for 2 hours while everyone else is having fun. So I could easily bring my wine poached pears and a tub of mascarpone or that lush tiramisu you can find below in my list! Put it on the table and everyone can take as much as pleased. So please take a look at these 14 delightful Christmas desserts and enjoy! A few are mine, but the biggest chunk of recipes comes from other food bloggers I love. Merry Christmas and bon appetit! 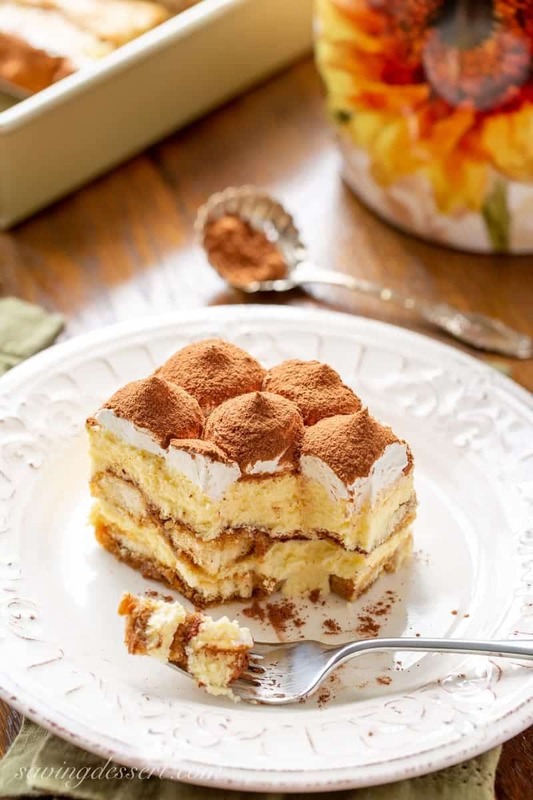 And allow me to start right off the bat with a extremely yummy classic… a lush and creamy Italian tiramisu! I have made tiramisu once a few years ago. Why don’t I prepare tiramisu a little more often?2. Because my lovely neighbour Helen makes the best tiramisu I have ever tasted. She got the recipe from another Italian neighbour. The tiramisu Helen makes is the best, never had a better one before to be honest! Melts in your mouth. Excellent. So if I am going to make a roundup of Christmas desserts that I love, then a classic tiramisu has to be in it. So I have chosen Tricia’s tiramisu recipe, she’s the food blogger behind Saving Room For Dessert. And that’s exactly what I would do if I knew that Tricia’s tiramisu was coming! Look at this tower of goodness. Speechless. Thanks a ton, Tricia! Here’s a very important question for you: are you a cobbler person or a crumble person? I’ve thought long and hard about the right answer in my case and at the end of the day I have to admit that I have a slight preference for cobbler. Guess it’s just a matter of presentation because the ingredients are more or less the same, right? Anyway, I’m not too fond of fruits in savory dishes. But I’d fight for a good fruit cobbler. Preferably one with warm smooth peaches in it. 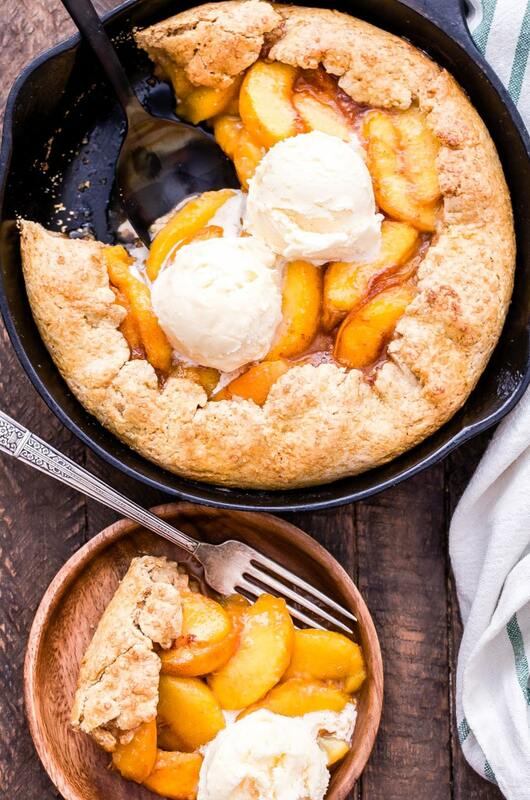 And that’s exactly what I get here with Danae’s skillet peach cobbler recipe! She is the food blogger behind Recipe Runner. And what really gets my heart beating is that ice cream on top! My husband would say, gosh I thought you didn’t like ice cream. I do when it is served with a warm dessert tucked underneath it. See that ice cream melt. Nailed it. Thanks Danae for the inspiration! Poached pears in red wine… An easy make ahead dessert but also one of my ultimate Christmas desserts. Tastes great all year round! These poached pears in red wine look indeed spectacular, no doubt about that. 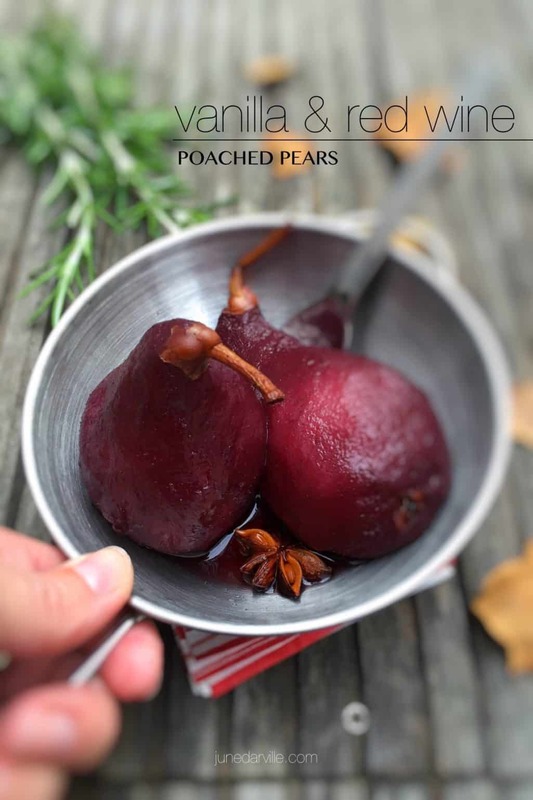 You can serve these poached pears in red wine just like that, preferably lukewarm. I also like to add a spoonful of whipped cream or mascarpone if I got any, finished with some crumbled (almond) cookies. The poaching liquid can also be used: add a couple of tablespoons of the wine mixture to a small saucepan and let it reduce a little until you got a strong ‘sauce’. Drizzle that on top of the pears and mascarpone… yum! Maybe you are looking for a good non-alcohol alternative to replace the wine with? You really want to keep that red color on those pears but you don’t want to add wine, substitute it by cranberry juice or any kind of fruit juice that is strong enough to color those pears. I do like a filling dessert you can put straight on the table so that everyone can take as much as they all please. 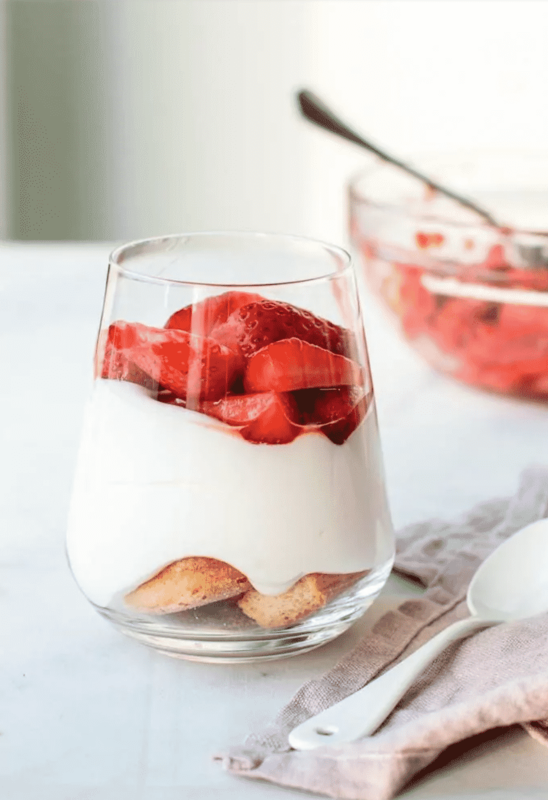 But what’s even better is to make a dessert in separate jars, glasses or ramekins. 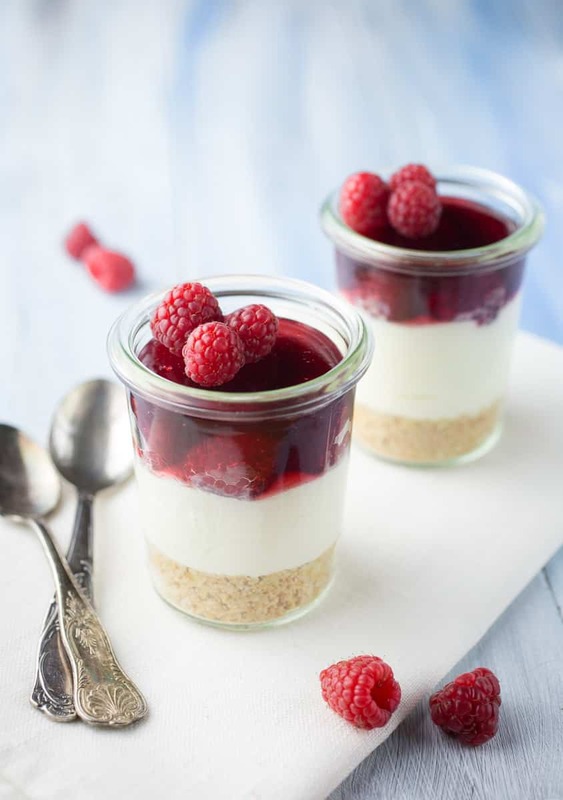 And that’s what I get with these individual raspberry cream cheese dessert jars I discovered on Sandy‘s food blog! She’s the food blogger behind The Girl Loves To Eat. I’m a huge raspberry fan anyway so it’s no surprise that these cute looking desserts caught my eye while browsing through tons of Christmas desserts online. So this is a layer dessert. From bottom to top: crumbled graham crackers, sweet cream cheese, raspberry jelly and fresh raspberries. The fact that this dessert has to set in the fridge for at least 3 hours makes it a perfect make ahead dessert, something I like when you are throwing a full Christmas dinner at home! Hands down a great and stunning looking dessert recipe. Thanks Sandy! 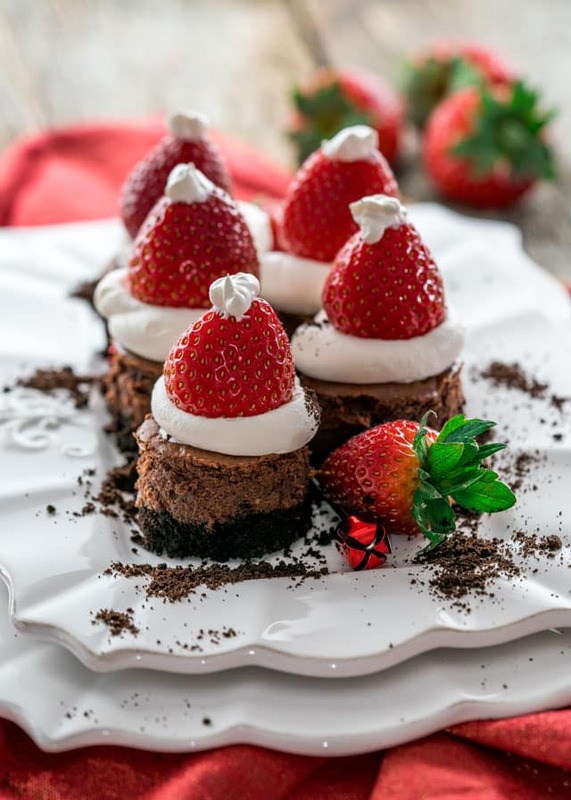 And speaking of cute looking desserts, what do you think about these little strawberry santa hat cheesecakes? I’m sure that these cute chocolate cheesecakes don’t look as intimidating as a big slice of freshly baked pie with ice cream or whatever. But I’m sure that by the end of your Christmas meal you start to feel quite full. Drinks, nibbles, appetizers, a soup or a starter, then a full blown Christmas dinner with all the side dishes you could ever wish for. Nevertheless, there’s undoubtedly always room for one of these little treats, just to end on a sweet note. I found this recipe at Jo Cooks, a food blog run by Joanna. I come across Joanna’s recipes almost daily and she always find a way to attract my attention. I like the playful santa hats because I’m sure you could even assemble these cheesecakes with your children or grandchildren! 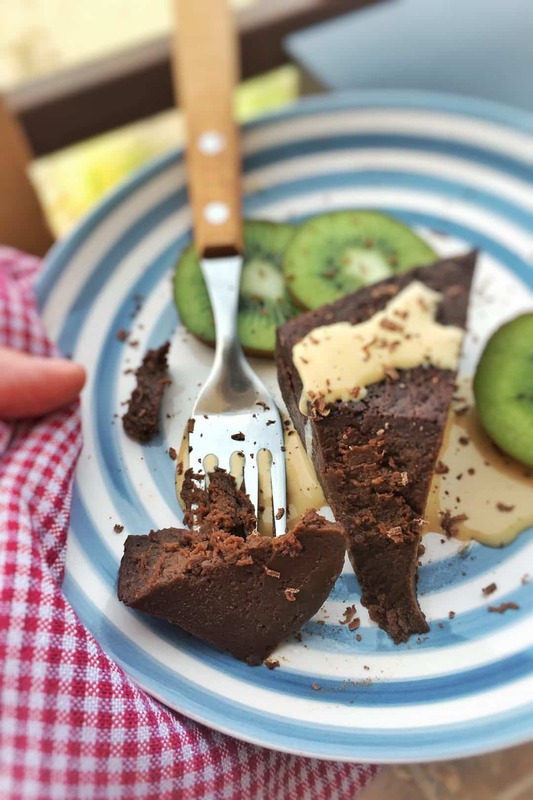 This chocolate cake is the very first gluten free dessert that I made on this blog ever. I was preparing dinner for a few friends and one of them is gluten intolerant and because of that here’s a my challenge to keep dinner gluten free! I had never made a flourless chocolate cake before. But there’s a first time for everything, no? Good to know: when this flourless chocolate cake comes out of the oven it wil be quite wobbly and you’ll get the impression that it hasn’t set at all. Don’t worry, here’s the catch: my flourless chocolate cake recipe isn’t done yet. It needs to rest, chill and set overnight in the fridge to get its unique texture. Well this flourless chocolate cake sounds like a great make ahead Christmas dessert to make in advance to me! Make the cake the day before, all you have to do when your guests have polished off their Christmas dinner plates is to slice the cake up. I know that this next Christmas dessert looks pretty similar to the raspberry cream cheese glasses from Sandy I talked about a little earlier on in the Christmas desserts roundup. The ingredients and composition are different though. Credits go to Shiran who’s the food blogger behind Pretty. Simple. Sweet. And let me lazily copy paste her explanation behind the white chocolate filling, I couldn’t say it any better: “I use this delicious cheesecake filling in many of my no-bake recipes. It’s not too sweet because of the tangy cream cheese, and it has a moussey, fluffy texture. The addition of white chocolate makes it extra velvety and creamy.” No graham crackers but ladyfingers here! And I like how Shiran makes a simple fruit coulis with strawberry jam. This dessert is easy to put together and again, looks absolutely stunning. A dessert to remember! My French recipes chapter is yet again a little prettier because I now added this savory sweet crepes suzette recipe. Have you ever heard of crepes suzette? 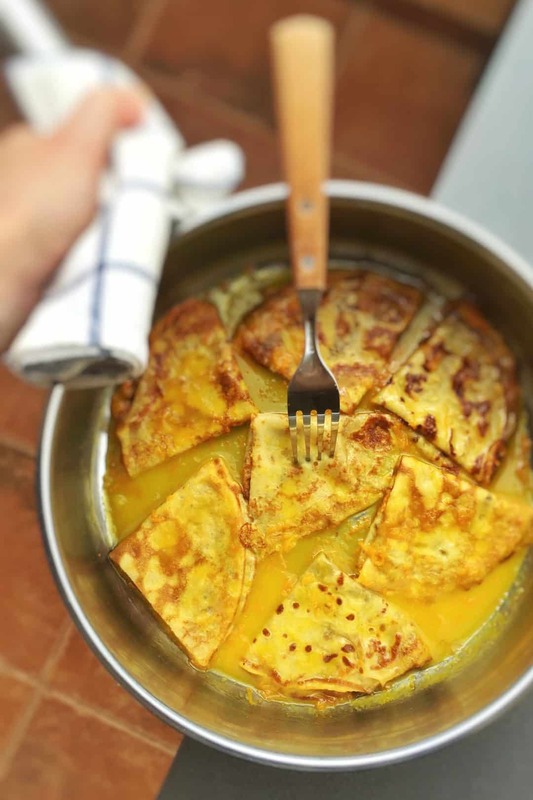 It’s a great dessert containing very thin crepes that are drenched in a warm orange, butter and Grand Marnier sauce until moist and velvety… Yum! I love the fancy look these butter and orange soaked folded crepes have but don’t let that fool you. Hard to make? Until you see how easy it is to make this delicious crepes dessert. And the best part: you can prepare this dessert in advance. Bake the crepes and then assemble the orange sauce in a frying pan. Store everything in the fridge. 10 minutes is all you need to finish this dessert: just warm the folded crepes through in the simmering orange sauce. Yum! I love making and baking pies from scratch. That means making some fresh pastry dough for the crust! Don’t get me wrong, using store bought and ready rolled pie dough isn’t bad. If you don’t find the time to make pie dough from scratch, then that’s a better option of course! So that homemade pie dough is what attracts me here in this pecan pie recipe by Shinee. She’s the food blogger behind Sweet And Savory By Shinee. 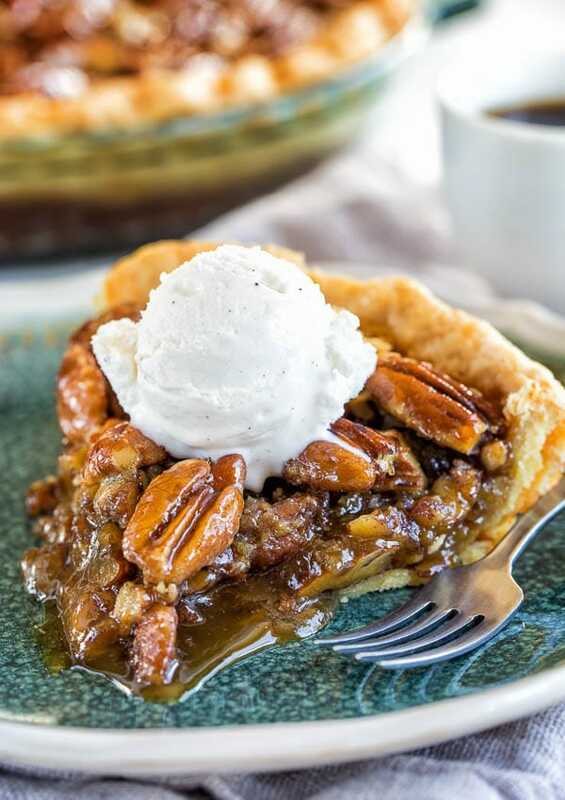 Another thing that makes me salivate instantly is that gooey and runny sugary pecan pie filling. See how it oozes on the plate, yum! And again, I would definitely put a nice scoop of creamy ice cream on that warm slice of freshly baked pecan pie! If you are not such a baking and dessert star like me, then you might feel more comfortable if you prepare a good old bundt cake. Google bundt cake and there are thousands of recipes popping up. So choosing one for this Christmas desserts roundup wasn’t easy in the beginning. 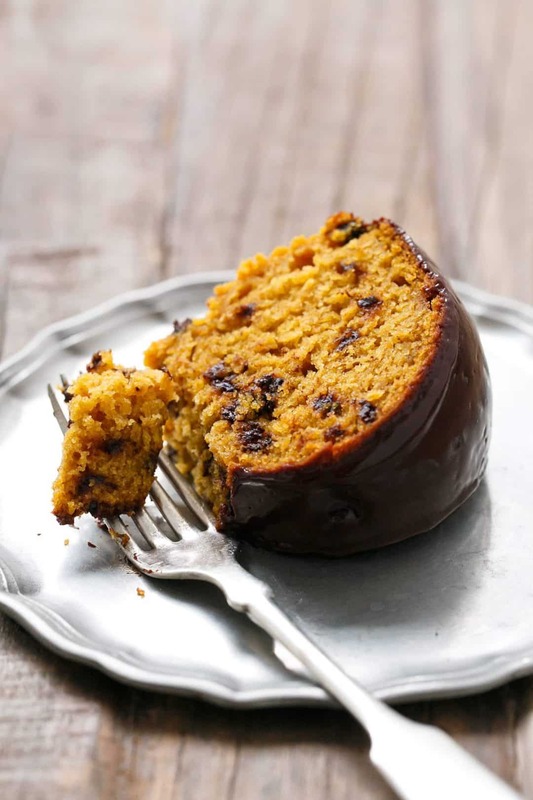 Up until the minute I saw this one: a pumpkin chocolate chip bundt cake. I loved the color of it instantly. Looks like a perfectly fluffly cake to me! Definitely a cake that I could make too! Thanks for the inspiration! And what’s a Christmas dinner without a proper batch of eggnog! Love eggnog, check out my recipe! 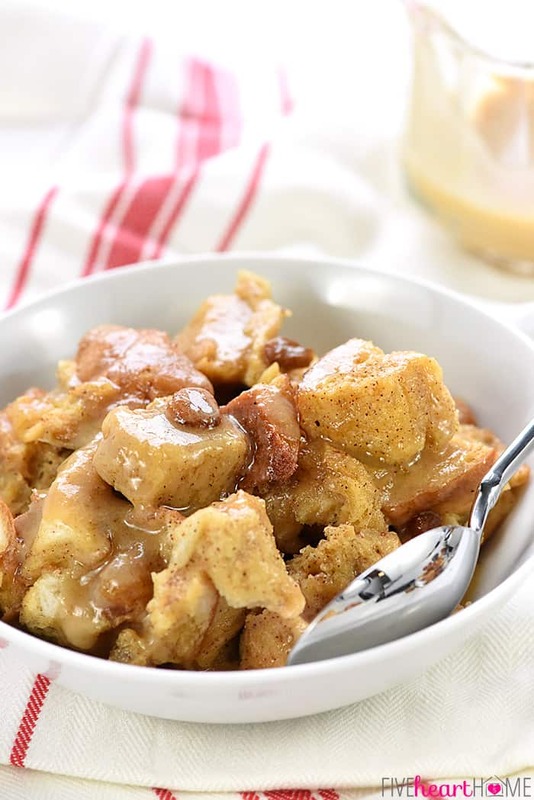 Or take a look at this very next sweet treat: eggnog bread pudding in the slow cooker! I love how smooth and silky that bowl of stewed bread pudding looks. Watch out because this is sugar overload: just give me a spoon and I’m all set to dig in! Credits for this recipe go to Samantha! She’s the food blogger behind a blog called Five Heart Home. Sure I love a good eggnog, but I adore the idea of turning it into a lovely sweet dessert by adding bread to it. And since you can prepare this one in the slow cooker, you can put all the necessary ingredients in your cooker and leave it simmer in your kitchen while you enjoy Christmas dinner with your family and guests! This one will be an instant hit, looking forward to it! I admit: I’m not very good at making desserts. So when I’m in charge of the dessert part for dinner with friends, I try to keep it very simple and easy because I like to go for a dessert that is safe and won’t fail. 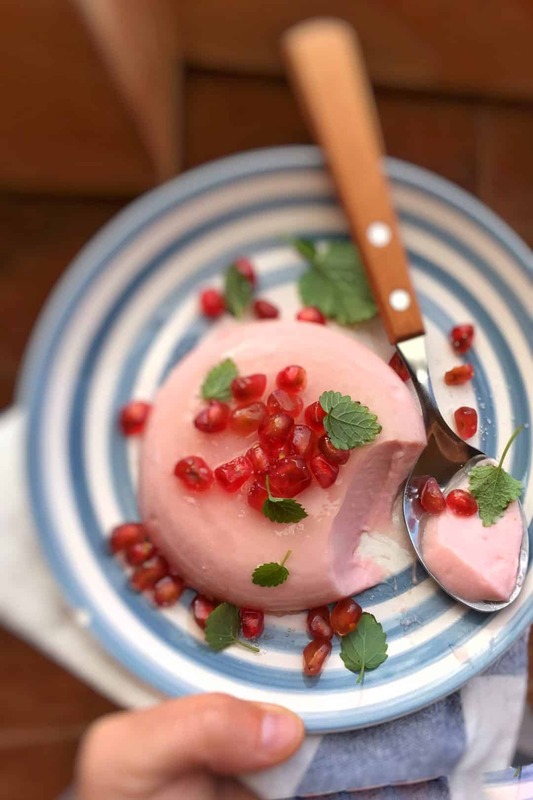 A good example of such a dessert is this very simple creation: my strawberry yogurt panna cotta sprinkled with fresh pomegranate seeds and lemon melissa. You might think: panna cotta is quite a tricky dessert! Well if you do it right, then you’re good. It’s all in the ratio of the ingredients. Just stick to the recipe because you’ll see how easy it is. Also check out another version: my lemon panna cotta! I first thought I would make a kind of syrup with the pomegranate but in the end I dismissed that idea and simply sprinkled the panna cotta with the seeds. I liked the crunch it added to the creamy panna cotta! The panna cotta is very creamy already so actually I was happy that I didn’t waste any time trying to make that syrup. And it looked just fine, a couple of fresh green leaves to garnish it. Done. Who doesn’t love classics? Especially when we’re talking about dessert! I often make a good old apple pie from scratch and I’m absolutely fond if it. But for this Christmas roundup I thought I would search for a similar recipe, but with a creative twist. And that’s when I stumbled upon this gorgeous looking pie: turns out it’s got a mixture of 2 fruits in it. And how I love the sound of it: an apple and pear pie! This one comes from a food blog called Cooking with a Wallflower, and credits go to Andrea who’s behind it! 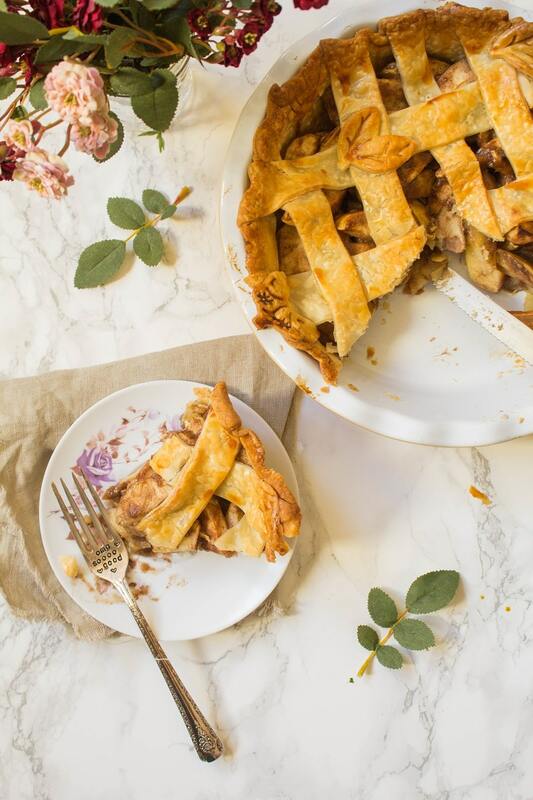 I love everything about this double crusted pie filled with warm cinnamon apples and pears in it. This delicious apple and pear pie is without a doubt the perfect Christmas dessert! And how beautifully decorated is that top crust! A true eye catcher, your family and guests will be happily surprised by your handiwork I’m sure! Excellent recipe and dessert, top notch. True, sweet rolls and cinnamon rolls make a gorgeous breakfast. But I also love them as a dessert. And that’s why I finish my Christmas dessert roundup with a heavenly looking sweet roll recipe! Found these blueberry sweet rolls on a food blog called My Baking Addiction that’s run by Jamie. Again, there are many sweet roll recipes out there but I immediately went for this one when I saw that it had blueberries in it. I love warm blueberries in pastry or fluffy bread. And here again, I love the idea of making the dough from scratch. I like to get my hands dirty! 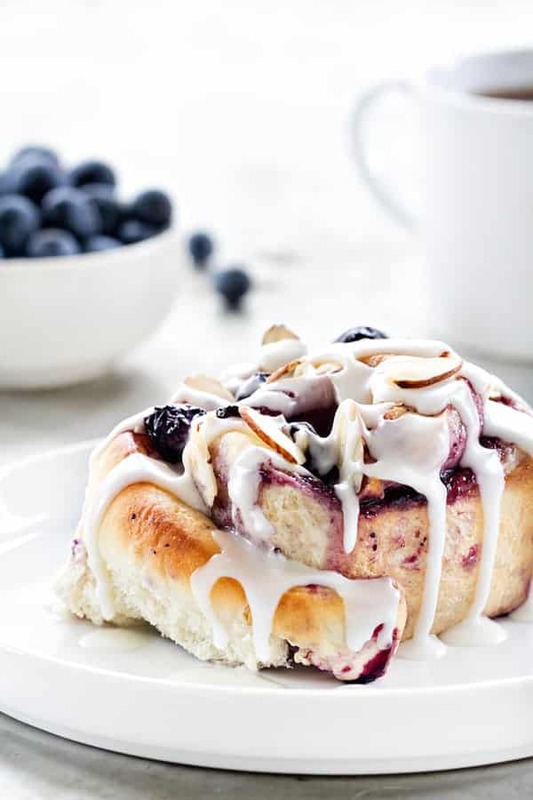 Soft and light rolls with smooth blueberries and a generous topping of frosting… I’m all ears!